Morton secured a Scottish Premiership promotion play-off berth with a home draw against Ayr United. Lawrence Shankland and Craig Moore scored a goal apiece in the final 10 minutes of the first half, earning a valuable point for both sides. Defeats for Queen of the South and Dunfermline mean Morton can no longer be caught in fourth place in the Championship, with two games remaining. While bottom side Ayr move within two points of St Mirren. The Saints failed to take anything against Dundee United, and slipped back into the relegation play-off position. At Cappielow it was an afternoon for on-loan Premiership strikers. 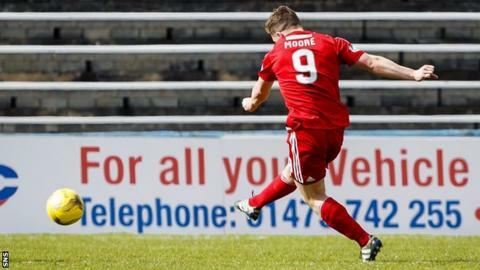 Aberdeen's Shankland arrived at Morton after spending the first half of the season at St Mirren and notched his third goal for the Ton in clinical style. Gary Oliver's effort from the corner of the box looped up off a defender and fell nicely for Shankland to despatch past Greg Fleming. But this was a Morton side that had failed to win in their last seven outings, and their lead lasted less than 10 minutes. Motherwell's Moore has had an injury-plagued season on loan at Somerset Park yet made up for lost time by burying a rising shot in the top corner after being teed up nicely by Mike Rose in first-half added time. Overall, it was a fairly insipid match. Ayr's Paul Cairney blocked Thomas O'Ware's goal-bound header on the line when the game was still goalless and Shankland had spurned a couple of earlier opportunities as well. Had a visiting player been able to get on the end of Nicky Devlin's cut-back near the end, then Ayr might have taken all three points. Morton assistant manager Craig McPherson: "We're delighted to get the fourth place secured. It's a fantastic achievement and you've got to look over the nine months of the season. "The boys have been really consistent and have hit a wee bit of poorer form from our usual standard but everyone hits a spell like that." Ayr United manager Ian McCall: "A draw was a fair result and that point could be crucial. "It gave us a lift with Craig Moore scoring a great goal and we were on the front foot for most of the second half. Our final ball at times wasn't quite good enough. "We're a point closer to St Mirren and we'll see how Raith Rovers do against Hibs [on Wednesday]." Match ends, Morton 1, Ayr United 1. Second Half ends, Morton 1, Ayr United 1. Attempt saved. Craig McGuffie (Ayr United) left footed shot from the right side of the box is saved in the top centre of the goal. Substitution, Morton. Jamie Lindsay replaces Michael Tidser. Attempt missed. Michael Rose (Ayr United) right footed shot from outside the box misses to the right. Corner, Ayr United. Conceded by Lee Kilday. Attempt missed. Declan McDaid (Ayr United) right footed shot from outside the box misses to the left. Gary Harkins (Ayr United) is shown the yellow card for a bad foul. Michael Doyle (Morton) wins a free kick on the left wing. Substitution, Morton. Mark Russell replaces Aidan Nesbitt. Attempt saved. Ross Forbes (Morton) left footed shot from the centre of the box is saved in the bottom left corner. Corner, Ayr United. Conceded by Aidan Nesbitt. Attempt missed. Thomas O'Ware (Morton) right footed shot from the centre of the box misses to the right. Corner, Morton. Conceded by Ross Docherty. Attempt saved. Ross Forbes (Morton) right footed shot from a difficult angle and long range on the right is saved in the top right corner. Daryll Meggatt (Ayr United) is shown the yellow card for a bad foul. Jamie McDonagh (Morton) wins a free kick in the defensive half. Substitution, Morton. Jamie McDonagh replaces Lawrence Shankland. Substitution, Ayr United. Craig McGuffie replaces Paul Cairney. Attempt missed. Gary Harkins (Ayr United) right footed shot from outside the box is high and wide to the right. Corner, Ayr United. Conceded by Ricki Lamie. Attempt missed. Craig Moore (Ayr United) right footed shot from the right side of the box is high and wide to the left. Attempt blocked. Thomas O'Ware (Morton) left footed shot from the left side of the box is blocked. Michael Doyle (Morton) wins a free kick in the defensive half. Craig Moore (Ayr United) wins a free kick in the defensive half. Attempt missed. Nicky Devlin (Ayr United) right footed shot from the right side of the box is close, but misses to the right. Attempt saved. Aidan Nesbitt (Morton) left footed shot from outside the box is saved in the top centre of the goal. Aidan Nesbitt (Morton) wins a free kick on the right wing.